This album is an incredibly unique work, beautiful and very difficult to categorize. The musicians on the album are Tony Levin, Jerry Marotta and Steve Gorn. The music was recorded binaurally, microphones tucked inside the engineers ears, within The Widow Jane Mine, near Woodstock, New York. Due to the nature of the recording, it is best appreciated by listening with headphones. 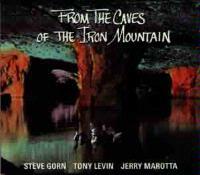 Tony Levin-From the Caves of the Iron Mountain is available for purchase directly from Papa Bear Records. The price is $15.00 and $2.50 for shipping and handling. To order from Papa Bear Records, write to Papa Bear Records, P.O. Box 498, Woodstock, NY, 12498. 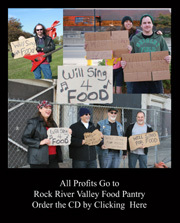 Be sure to visit their web page at http://www.papabear.com , to get a copy of the online order form or call 1-800-688-2227 to order by phone. This is a very brief and unique track. Essentially a texture piece, Approaching the Caves is a document of the recording engineer approaching the cave with Steve Gorn`s soprano saxophone playing in the background. This piece utilizes, drums, shakers, stick and clarinet to produce an interesting rhythmically driven track. The stick produces the rhythmic momentum of the song, in a slightly Crimsonesque mode, while the clarinet carries a melody that seems to be in a world sort of format. Beginning with unaccompanied bansuri Indian flute, a slow and resonant bass line comes in and begins to lead the way. Eventually the flute returns and the drums join in, bringing a very intriguing sort of sound. This sound is somewhat ethnic in approach, but still feeling quite modern and innovative at the same time. This track derives it`s title from the fact that Jerry Marotta eventually winds up drumming in the water at the edge of the cave`s lake. This piece is a nicely sedate and intricate work, and feels very impromptu. Starting with duet of soprano sax and stick in very laid back textures, once the drums jump in, the tension jumps. This is a dramatic piece, made more dramatic by the fact that the microphones are moved throughout the recording, the engineer wandering around the cave and amongst the musicians. This, as with the rest of the album, is certainly a headphone track. This track begins on shakers. 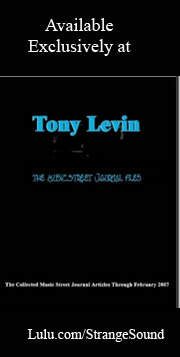 Eventually, Tony Levin joins in with some quite low and resonant bass tones. Steve Gorn finally comes in on the Indian flute, bringing a nice eastern sort of texture to the piece. Glass Beads is very exciting and sort of evolves out of the ending of Shakers in Five. The stick strains really set a wonderful mood here, with the other instruments augmenting the low tonal melody. This number, extremely effective, is one of the most wonderful tracks on the album. Drumming starts off this track, which is a rather joyous sort of work, featuring stick and clarinet. This section, (Tony Levin bowing on the NS upright bass), starts this piece with very low tones, which seem as if they would do nicely as the soundtrack to a particularly tense scene in a horror film. Continuing the piece, drums gently enter and Levin switches to the stick. Once Gorn joins in on the Indian flute, the number changes modes again. It becomes at once both more delicate and tense. For this segment of the track, the stick starts taking more of a prominent position in the music again, leading the work for a time. The drums take on an almost American Indian sort of feel. This is a nice relaxing and beautiful movement. Shepherd`s Song is a rather energetic and fun sort of piece, featuring Bansuri, Stick and drums. Starting off in a very sedate and calming mood, Catacombs takes a dramatic turn in pacing for a while, as the drums enter quite loudly, and the stick goes to a very tense and powerful segment. Just as suddenly as the composition turned the corner to the dramatic, it jumps back down to the sedate. In time it jumps back up in tension, volume and pace, before returning once more to the subdued. This is another fairly settling percussion based piece. Once the box bass joins in, however, it moves in a nice pattern focusing on some wonderfully low tones. Beginning with very organic sounding drums, eventually bass joins in, followed shortly by Steve Gorn doing harmonic chanting. This gives a primitive feel to the piece, while the bass work brings it into the modern age. The sounds of packing up the gear are mingled with Jerry Moratta playing a squeezebox which the liner notes say he "smuggled into the cave midst his percussion".